More than 17.6 million Americans were victims of identity theft in 2014 alone. Most victims discovered their information had been compromised when their banks contacted them about suspicious activity. Thieves are more sophisticated than ever, often using technology to help them steal information. Other times, they prey on the trusting nature of people to procure personal information. If you use an ATM or other card reader, you may become a victim of identity theft and not realize it until you look at your account statement. Thieves have been using counterfeit card readers in tandem with hidden cameras to steal the information on ATM cards for several years. Once you slide your card into the reader and punch in your PIN, the thief has enough information to make another card. Incidents were up 546% in 2015, with more than 60% of incidents occurring at non-bank ATMs. While more financial institutions are incorporating EMV chips into their debit and ATM cards, which make it more difficult to counterfeit a card, not all of them have converted yet. Reduce your risk by avoiding non-bank ATMs and monitoring your accounts for unauthorized activity. 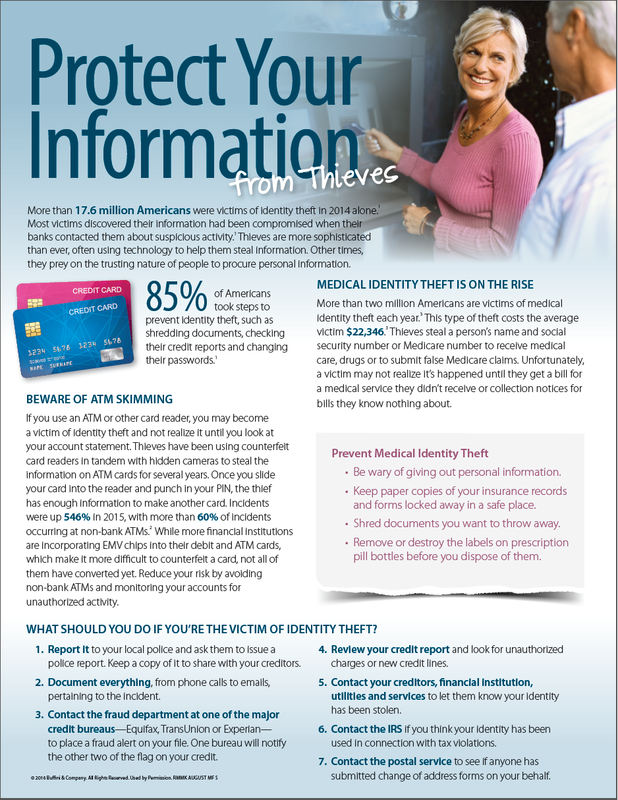 More than two million Americans are victims of medical identity theft each year.3 This type of theft costs the average victim $22,346.3 Thieves steal a person’s name and social security number or Medicare number to receive medical care, drugs or to submit false Medicare claims. Unfortunately, a victim may not realize it’s happened until they get a bill for a medical service they didn’t receive or collection notices for bills they know nothing about. • Be wary of giving out personal information. • Keep paper copies of your insurance records and forms locked away in a safe place. • Shred documents you want to throw away. • Remove or destroy the labels on prescription pill bottles before you dispose of them. WHAT SHOULD YOU DO IF YOU’RE THE VICTIM OF IDENTITY THEFT? 1. Report it to your local police and ask them to issue a police report. Keep a copy of it to share with your creditors. 2. Document everything, from phone calls to emails, pertaining to the incident. 3. Contact the fraud department at one of the major credit bureaus—Equifax, TransUnion or Experian— to place a fraud alert on your file. One bureau will notify the other two of the flag on your credit. 4. Review your credit report and look for unauthorized charges or new credit lines. 5. 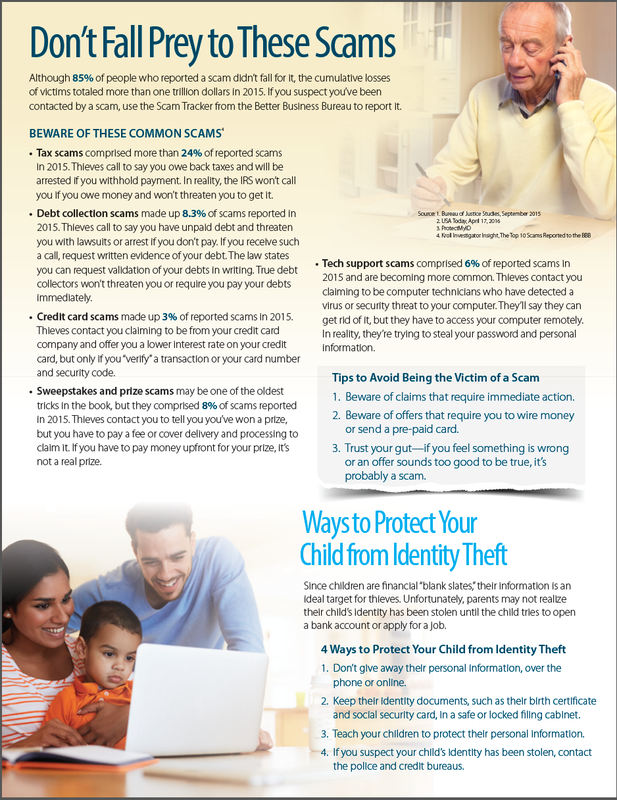 Contact your creditors, financial institution, utilities and services to let them know your identity has been stolen. 6. Contact the IRS if you think your identity has been used in connection with tax violations. 7. Contact the postal service to see if anyone has submitted change of address forms on your behalf.